Holly Shaw: Is 41 Too Old for Forever 21? There was a time that I was convinced we could never be friends. After several failed attempts to find all the cute clothes at reasonable prices that I kept seeing others wear (out and about and on blogs) I had just about given up on Forever 21. The original store in our mall was Tee-tiny and I had to dig through crowded racks and skinny teenagers with the dwindling hope there might be something in a size other than XS. I always left in dismay feeling old, frumpy and fat. Well, hope springs eternal and now it even has two floors. Forever 21 recently moved into a bigger store and I can say with confidence that we can be friends after all. Maybe too good of friends if I'm not careful. 75% of the clothes and accessories are too young for me or just not practical (possibly bordering on ridiculous, maybe that's just me), but if you are determined and discriminating even a 40+ mom can find some fresh, hip, reasonably priced pieces to add to her wardrobe. I was looking for basic layering pieces that I could wear with jeans or leggings (that is, of course, if I get my nerve up to wear my black leggings) and I was giddy to find a few lightweight, asymmetrical open front cardigans and a drape-y vest (black with metallic threads, oh my!) that I can mix and match. I also stepped waaaay out of my fashion comfort zone and bought a floral print (small florals) dress to wear with leggings and a ruffly cardigan (I hope it turns out as cute as I pictured it in my head). I've been feeling quite schlumpy and frumpy lately, so today's little shopping spree boosted my spirits in a completely superficial and temporary way. so, where are the photos, missy?!? For reals we need pics! I love the sound of the floral dress/leggings/ruffly cardigan! You can be our fearless leader, leader of the frumpy moms no more group! (By the way...you always look adorable!) I was in a store yesterday with a skinny, cute, hip teenage employee. She had on a greeaaat necklace. Forever 21 she said, $6. Gotta love THAT price! I was surprised this store moved into that bigger area. I guess I will have to go back in there one day....I felt the same way you describe when I took my daughter in the old shop, looking for something for a friend. Trust me, the new store is sooo much nicer and definitely worth a trip to check it out. I really liked their selection of necklaces. I'd been yearning for a yellow necklace and snagged a cute one for $4.80! Apparently owls are back in vogue too, FYI. I'll post photos as I wear some of the new stuff--if the weather holds and I can wear lightweight cardigans without passing out from heat stroke. 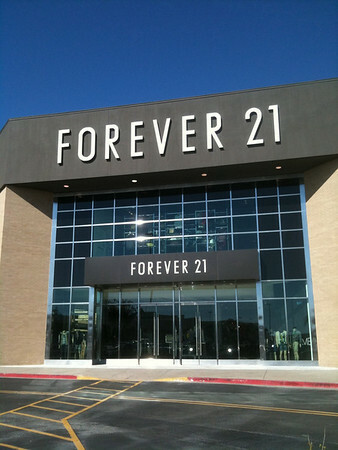 1) I'm totally jealous that you have a 2-story Forever 21 store.